It’s been quite awhile since I have done a what i wore post. Long overdue don’t you think? So let’s talk a little fashion shall we? The weather here in NoVa has been very squirrely these past few weeks. It has felt more like spring than winter. It was 70 degrees on Christmas Day!! I had to put the air conditioning on it as so muggy. That is just cray cray. I want my winter. I miss the snow. That being said, I have been wearing quite a few transitional pieces. The outfit above is one of my favorites. 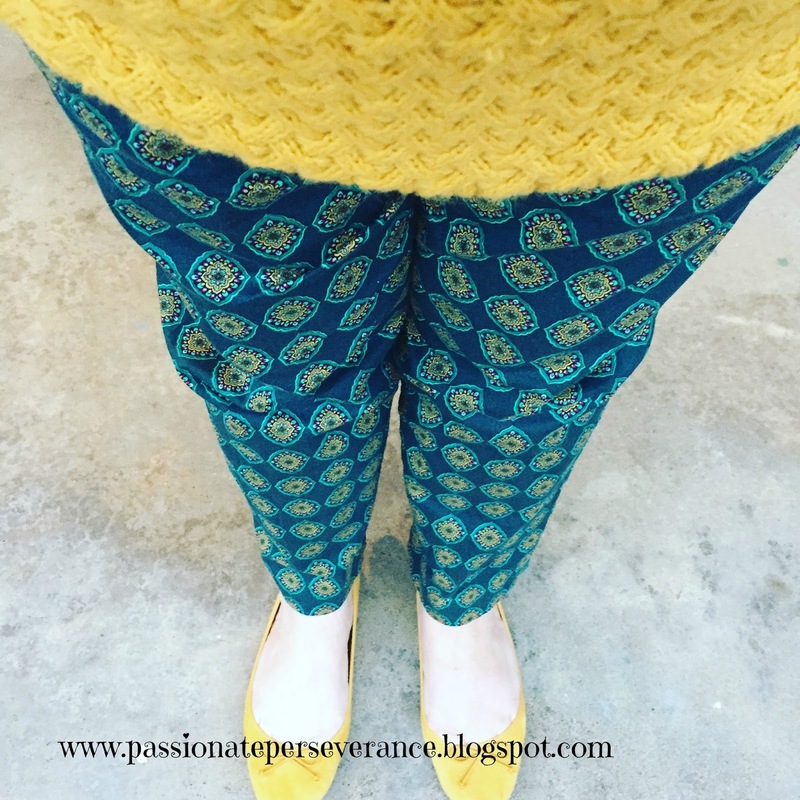 The colors make me smile and you know how I love a good patterned pant. The shoes are as comfy as they are colorful. 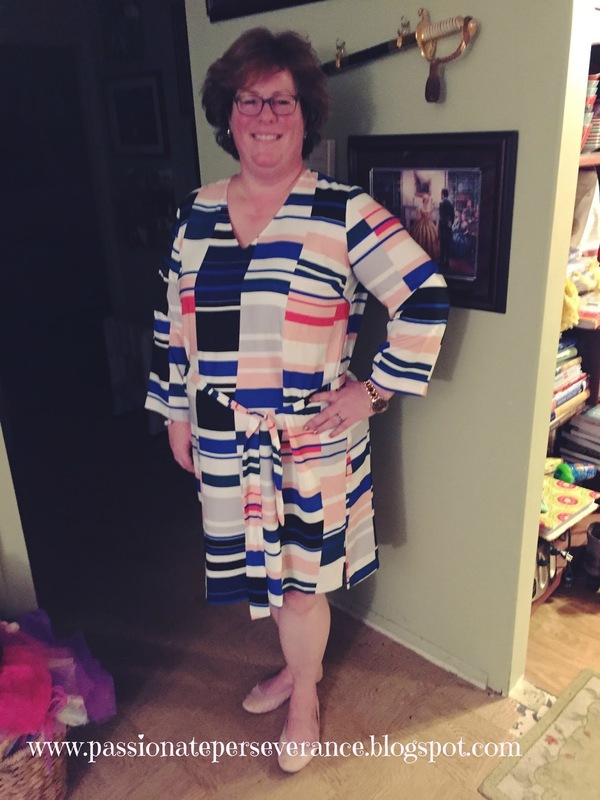 I also got to wear a happy color blocked dress a few weeks ago that I had been saving for a special Sunday. I thought Gaudete Sunday was a good time to break it out. I love a good sheath dress. It covers a multitude of fluffiness. I even wore pink shoes. I know, I know. Liturgically it’s rose but I didn’t have rose shoes so I wore pink. The collage below contains a few outfits I have worn in the week. Number one is from Christmas Eve. It was hot and muggy. I needed to be comfy since I was at the church from noon until around 2 am in the morning. I wore a green cotton princess seam dress for Land’s End. The shoes were red flats from DSW. I looked a little like an elf but I was comfortable and that’s all I cared about. The middle one, number two, I wore for a funeral this past week. 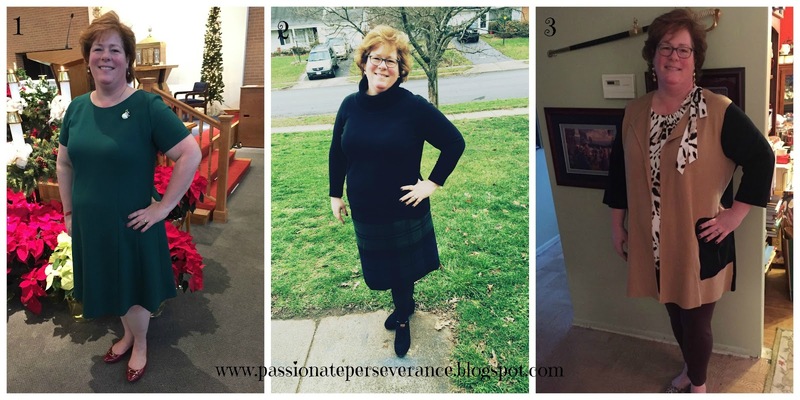 It is a black watch plaid wool skirt from Talbots and a black turtleneck sweater. I wore black patterned tights and my black Tom wedges. Finally in the last photo, number three, I went with a leopard print theme. The sweater jacket in camel and black, was a Christmas gift. It’s not too heavy and I love the length. I also wore Jones of New York sleeveless leopard print top and brown leggings. You're looking fabulous, mama!!! Love that sheath dress like WHOA. I am embracing flats these days Beth in a HUGE way. DSW and Macy's have some fabulous sales that I take advantage of. Talbots and Target too. Hugs friend and Happy New Year!! Of course we want you to. You're looking great. Thanks Carol!! Happy New Year!! Happy New Year! I miss you and look forward to more posts! It is one of my favorite places to shop Emily. Great sales too!! Keep the posts coming, Mary!